More and more contemporary clothing is knit in a very fine gauge by a machine. It is entirely possible to darn it by hand as you might a hand knit, but it is very difficult to match the gauge of the original fabric. I sometimes darn with embroidery thread, using a single strand. Sometimes I darn with machine sewing thread. In each case, the garment might be made of one fibre while the thread is made of another–but at least the darn will be less obtrusive if that is your goal, and the hole will not continue to grow larger as the knit fabric unravels. I recently snagged this fine cotton cardigan on a protruding nail. Ouch! 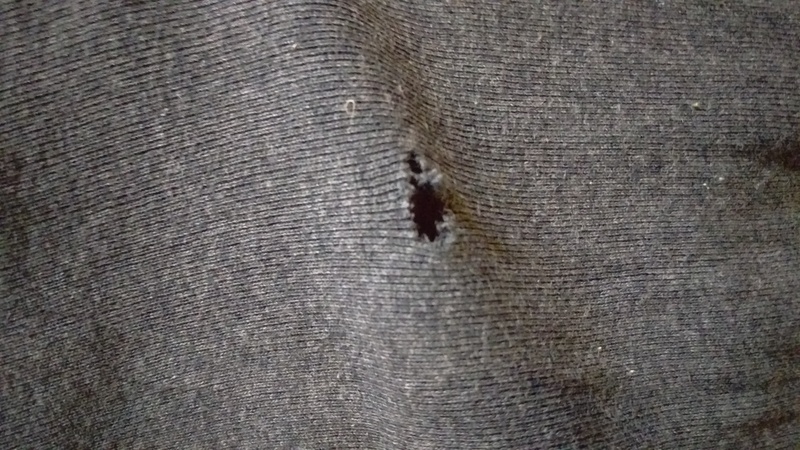 I decided against darning it and chose to patch my torn sleeve. This is a method I have been using a lot for threadbare sections or places where holes are small (and sometimes where there is more than one). It will also work for larger holes and you can choose a matching patch or a decorative contrast as you see fit. I like to make a patch that is larger than the hole. There will be no puckers around the damaged section and any stresses placed on the mend will be distributed more widely. 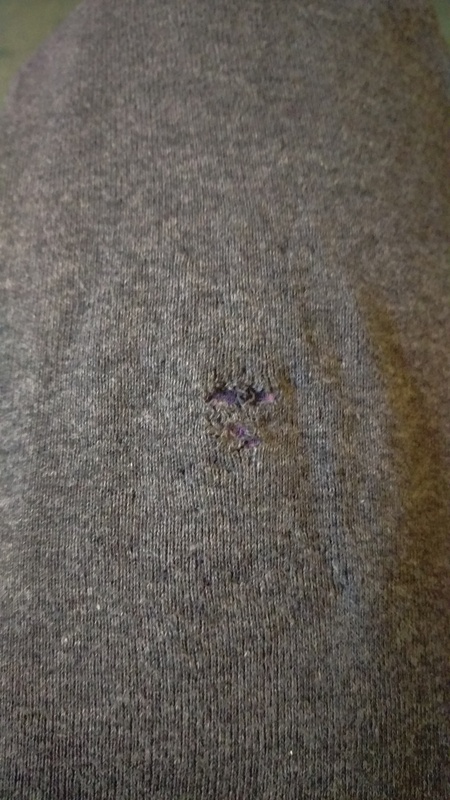 So here is the hole and the patch I selected (cut from a t shirt in the rag bag at our local Sustainability Centre). This method will make the patched area stretch less (or become incapable of stretching), and this has to be considered when deciding whether to use it. I begin by tacking the patch into position on the inside of the garment, checking carefully each time I change direction to make sure that I am not pulling the patch so it cannot lie flat. I use a running stitch, taking a tiny stitch on the outside and a longer stitch on the inside. I learned this approach from Jude Hill, a textile artist who uses it to hold layers of quilt fabric together. She calls it the glue stitch: and has a tutorial you might enjoy here. I have just adapted it to mending. Jude Hill’s work revealed to me that I had not been able to escape learning running stitch as involving stitches which are all of equal length. As soon as I had that thought (with her help), so many things opened up! It’s important to make sure all the edges of the tear are stabilised, and that the edges of the patch are stabilised too. I tend to then create a network of stitching so that the patch is stitched on to the outer fabric all over its surface. Pretty soon, there is your hole, mended. 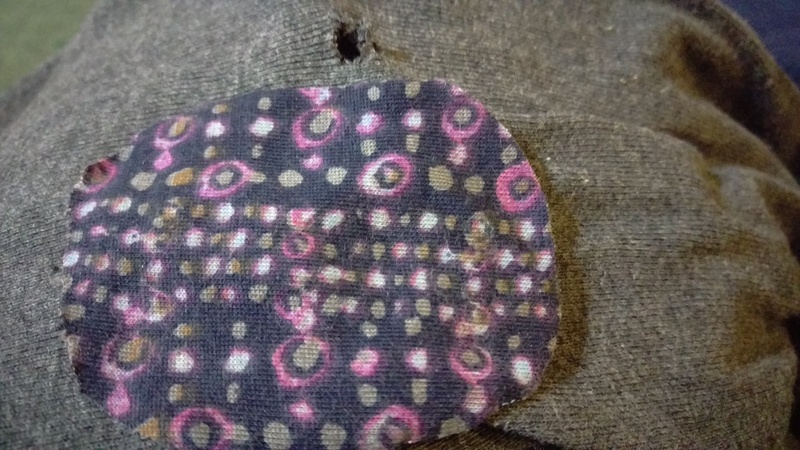 If all the cloth is still there, you can stitch the torn section down over the patch, as I have here, and have almost none of the patch fabric on show. I am sure this is visible mending, but it isn’t mending that draws the eye. Perfect for this garment. Happy mending! ‘Hate’ messing with knitted stuff, except if it is something I have knitted and that is different! Thanks for the glue stitch tutorial! This method has taken the stress out of it for me! Happy to share good information… love that glue stitch.